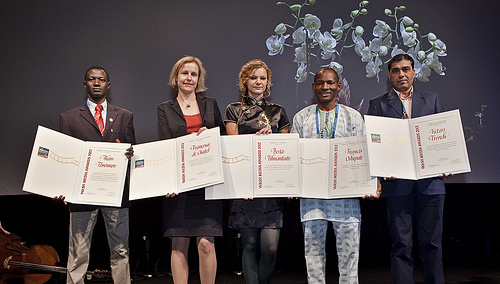 Five of the six World Water Week award winners with their awards, (from left to right),: Alain Tossounon, Francesca de Châtel, Berta Tilmantaite, Francis Odupute, Ketan Trivedi 2012 WASH Media Awards. 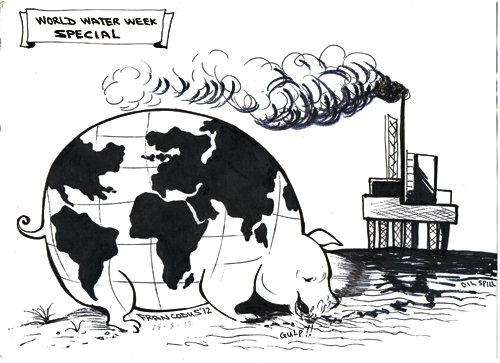 2012 World Water Week. Photo credits: Mikael Ullén. Ngala Killian Chimtom (Cameroon): "The Taps Have Run Dry"
Berta Tilmantaite (Lithuania): "The River Runs Back"
Francis Odupute (Nigeria): "The Strategists"
Francesca de Châtel (Belgium): "Water Around the Mediterranean"
Ketan Trivedi (India): "Alchemy of Earning Money through Wastes and Making a Village Clean, Hygienic and Lovely"
“Media in general and journalists, in particular, are key partners for sanitation, hygiene and water sector professionals in their awareness raising, advocacy and behaviour change work,” noted the sponsors of the bi-annual WASH Media Awards competition, the Water Supply and Sanitation Collaborative Council (WSSCC) and the Stockholm International Water Institute (SIWI). In the spirit of World Water Week and its goal to foster partnerships, Francis Odupute of Nigeria, winner in the cartoon/photo category, worked with Janine Selendy, Horizon International’s Chairman, President and Publisher, during the week photographing and videographing some of the interviews she was conducting. That experience led to a new long-term collaboration with Francis sharing his current cartoons and creating new ones for publication on Horizon International’s Solutions Site at www.solutionssite.org and for the “Supplementary Material” for Selendy’s book, ““Water and Sanitation Related Diseases and the Environment: Challenges, Interventions, and Preventive Measures,” a Wiley-Blackwell collaboration with Horizon International. Through cartoons, photos and feature articles, Francis Odupute has been reporting on a variety of social development issues in the media (focusing mostly on his country, Nigeria, such as: water supply, sanitation, health and hygiene issues, human rights, gender, democracy and governance, etc.) since 1993 as a freelancer. On 4th December, 2009, Francis received a Global Media Award for Excellence in Population Reporting (Editorial Cartoon category) from The P.I. (Population Institute), in Washington, D.C., USA. 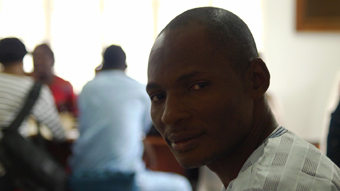 Francis leads a national network of Art and media experts in Nigeria (GRAFIK Reporters) under the umbrella of BFI Kreative Brainz Klub (BFIKBK) the Arts and Media organ of BFI and is a member of the Water and Sanitation Media Network in Nigeria. He is the founder and president of the Beautiful Feet International (BFI) Ministry in Nigeria, a faith-based organization whose objectives include charity, youth empowerment/moral suasion, development education and community health/WASH issues, media advocacy, educational literature distribution, etc. His cartoons, articles and photo reports on WASH issues appear on the Web sites of the Global Free Press (of which he is a member), eWASH and Pambazuka . 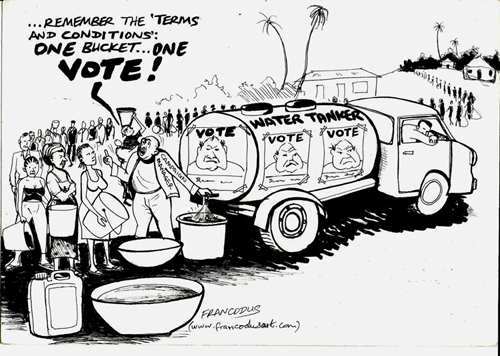 Permission to reproduce cartoons by Francis Odupute’s cartoons can be obtained from him directly. He can be reached by e-mail at francodus@yahoo.com. His Web site is: www.francodusart.com. He said that he can be consulted for cartoons, illustrations, paintings, photos, feature articles, etc. Ngala Killian Chimtom is a journalist from Cameroon who has been working for the state media for the past eight years, carrying out reporting tasks on radio and television. His winning audio entry is available at "The Taps Have Run Dry" . Berta Tilmantaite, from Lithuania, won for her TV entry "The River Runs Back" ( 无定之河) also available at http://sites.asiasociety.org/chinagreen/river-runs-back/. For thousands of years Beijing depended on the Yongding River, but for the last decade the river has been dry. Low rainfall and rampant industrial development caused the river’s demise. Reservoirs fed by the river are less than a tenth full, a symptom of a water crisis affecting the whole of Beijing. Now the river faces another dramatic transformation. Beijing’s government is spending the equivalent of over 2.5 billion US dollars to create a manicured landscape of lakes and parkland along the river. Designers say the project aims at restoring local ecology, but environmentalists believe that the facelift will only serve to increase pressure on Beijing’s water reserves. As Chinese officials increasingly appeal to environmental benefits when justifying large engineering projects, “The River Runs Back” takes an inside look at the development debate. Francesca de Châtel, from Belgium, is Water Editor at Revolve Magazine and coordinator of Revolve’s 2012 Water Around the Mediterranean special report "Water Around the Mediterranean" . Previously, she was editor-in-chief and managing editor of a leading English magazine in the Middle East: Syria Today. She is the author of “Water Sheikhs and Dam Builders,” “Stories of People and Water in the Middle East” (Transaction Publishers, 2007). She is also a free-lance writer, researcher, and journalist specializing in the Middle East and North Africa region and water/environmental issues. Her articles have appeared in the Observer, the Guardian, the Times (UK), Vrij Nederland (Netherlands), and various European journals and magazines. Ketan Trivedi, from India has been working as a professional journalist for 12 years. He won for his publication "Alchemy of Earning Money through Wastes and Making a Village Clean, Hygienic and Lovely". He started his career as a Reporter for Gujarat Samachar, the leading Gujarati language daily, at Vadodara. He working has been working as a Senior Reporter at Chitralekha, a leading Gujarati language news weekly, at its Ahmedabad bureau since October 2005. Alchemy of Earning Money through Wastes and Making a Village Clean, Hygienic and Lovely, by Ketan Trivedi, 15 August 2012. More than 150 entries from 40 countries were evaluated by a jury chaired by Mr. Mark Tran, a notable international correspondent for The Guardian, UK. The jury included Mrs. Faz da Hall, Executive Producer, Channel Africa, SABC, South Africa, Mr. Jon Sawyer, Executive Director, Pulitzer Center on Crisis Reporting, USA, Mr. Olivier Nyirubugara, Senior Trainer Voices of Africa Media Foundation, Rwanda/Netherlands and Ms. Vinaya Deshpande, The Hindu, India. The jury praised this year’s entries for their journalistic excellence, investigative ability, and originality. The Water Supply and Sanitation Collaborative Council's (WSSCC) mission is to ensure sustainable sanitation, better hygiene and safe drinking water for all people. Good sanitation and hygiene lead to economic and social development, yielding health, productivity, educational and environmental benefits. WSSCC manages the Global Sanitation Fund, facilitates coordination at national, regional and global levels, supports professional development, and advocates on behalf of the 2.5 billion people without a clean, safe toilet to use. WSSCC is hosted by UNOPS, supports coalitions in more than 30 countries and has members around the world. Visit www.wsscc.org for more information. The Stockholm International Water Institute (SIWI) is a policy institute that generates knowledge and informs decision-making towards water wise policy and sustainable development. SIWI performs research, builds institutional capacity and provides advisory services in five thematic areas: water governance, transboundary water management, water and climate change, the water-energy-food nexus, and water economics. SIWI organizes the World Water Week in Stockholm - the leading annual global meeting place on water and development issues - and hosts the Stockholm Water Prize, the Stockholm Junior Water Prize and the Stockholm Industry Water Award. Visit www.siwi.org for more information.